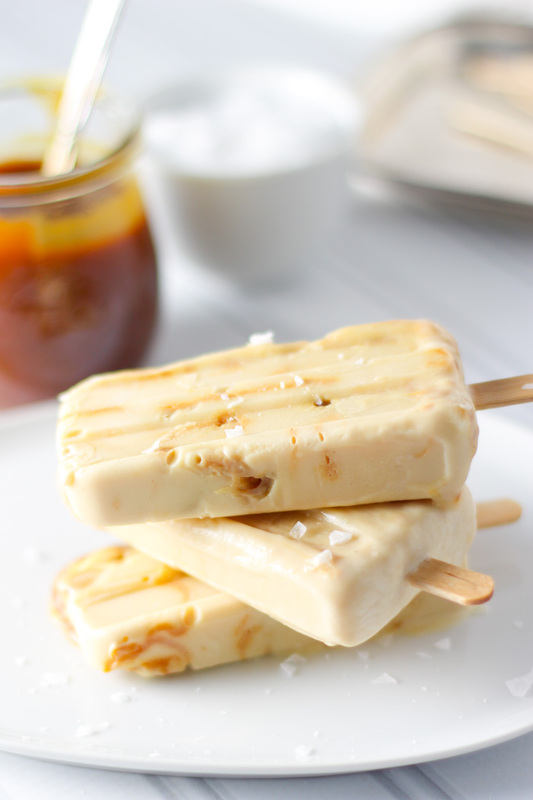 These Salted Caramel Yogurt Popsicles are a creamy treat for warm summer days! Although I love yogurt, dairy doesn’t always love me. So, when I saw that Walmart had Silk Dairy-Free Yogurt, I opted for that over the traditional greek yogurt variety. Plus, Silk Dairy-Free Yogurt provides 6 grams of soy protein per serving, calcium and vitamin D. I also picked up some Silk Vanilla Cashew Milk to make the popsicles extra creamy and to provide a bit of extra vanilla flavor. I may just be eating these every day for the next few weeks. And, it can be pretty much guaranteed that in 3 weeks and 1 day, I will be eating a steak and gnawing on some good bread (with the right side of my mouth, of course). Have any of you ever been on a soft food diet? Any tips for some good things to eat? I’d love to hear suggestions! Heat half of the salted caramel in the microwave for 20 seconds, until runny. 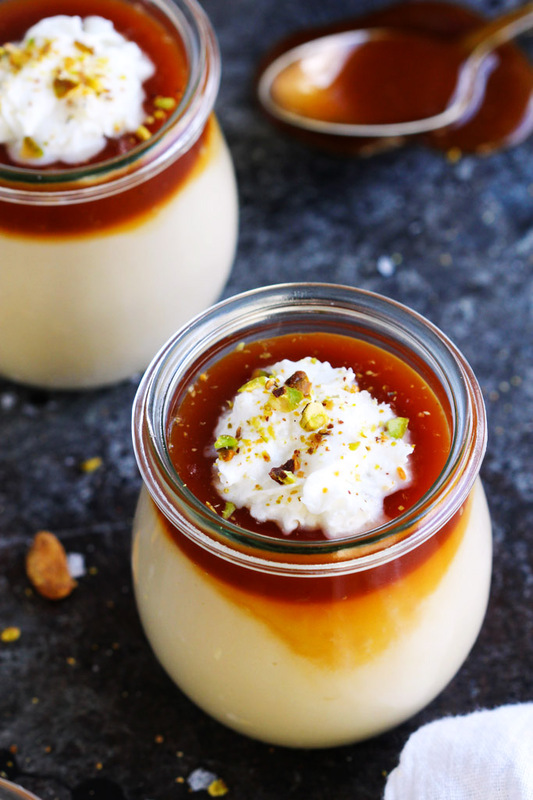 Place the yogurt and milk in a small bowl and combine with the heated caramel sauce. Stir to combine thoroughly. Slightly heat the remaining caramel, just slightly, so that is pourable, but not runny. (About 5-10 seconds). Glob this caramel into the yogurt mixture and, using a knife, make large swirls so that there are large ribbons of caramel running through the mixture. Fill the popsicle molds with this mixture and freeze until firm. To release the popsicles from the mold, run them under lukewarm water for about 30 seconds. If you loved this Salted Caramel Yogurt Popsicle recipe I would appreciate it so much if you would give this recipe a star review! Also, be sure to snap a picture of your finished dish and share it with me on Instagram using the hashtag #platingsandpairings and tagging me @platingsandpairings. Man- those look so creamy and delicious! Thanks Aubrie! The yogurt really makes them extra delicious and creamy! That’s a long time without solid food?! I wonder if I might start going into cheat mode like trying to find soft rice and pasta so it’s not so much chewing… 😛 Anyway, love the recipe idea with vanilla and salted caramel as this seems like a tasty but also pretty healthy treat for a hot day! Pech – You’re on the right track! I actually made orzo pasta the other night and topped it with my Sunday Gravy and parmesan. Really helped to hit the spot for something more substantial! Oh you poor thing! That’s a long time without solid food! 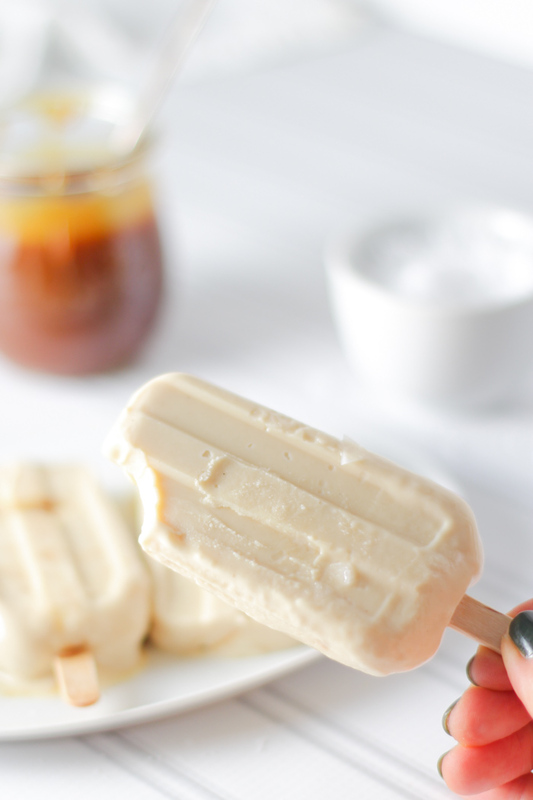 I wish I had some words of advice, but I would just eat these salted caramel yogurt pops all month — they look delicious! I think that’s a good plan Marlynn! You poor thing! I hope you have a really strong blender 🙂 Those popsicles look amazing tho! Emma – I am fortunate enough to own a Vitamix and I LOVE it. I’ve been tempted to blend up the pizza that my boyfriend ordered the other day… Just to see… Getting bored of soup! I been into that and I can’t eat solid food, I can only take soft and liquid .I ate baby food and cream of wheat everyday.. But that Salted Caramel Yogurt Popsicles looks so good, I want one now!!!!! I was almost thinking about the baby food thing… But these, these I think are much better! These Popsicles remind me of a well know ice cream creator right here in Columbus Ohio. The salty and the sweet is a wonder combination and I just can’t get enough. So yummy Erin. Thanks Ali! I’m such a huge fan of salted caramel – I’ll take it over chocolate ANY day! 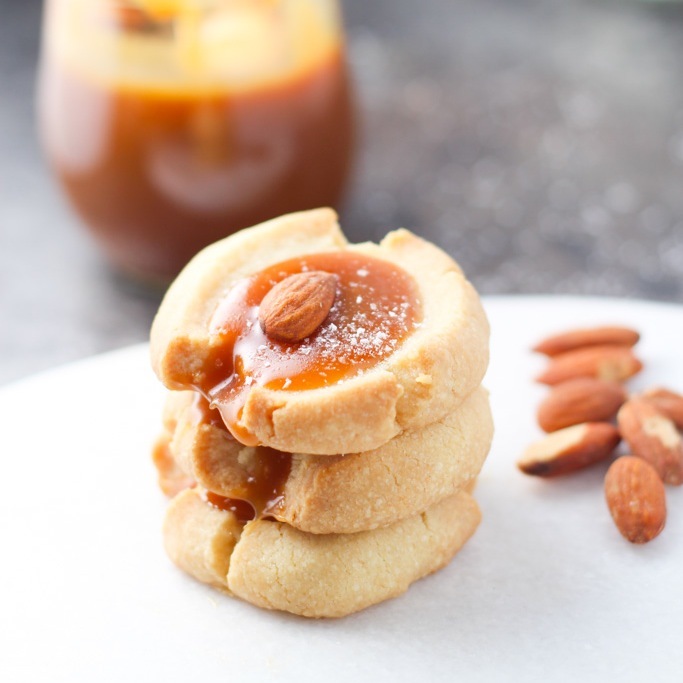 Wow – I love salted caramel and these look absolutely delicious!! I wish I had some advice beyond the obvious soups and juices to offer on the soft food diet. Thank you Kathryn! I’m on the countdown now – I’m almost halfway through the month of no-solid foods! Dying from deliciousness. And beauty. But mostly deliciousness. Um, that sounds decadent and amazing! Can’t believe you can’t chew for 2 months! Ugh. I had my wisdom teeth when I was 18 and remember not being able to eat solid foods for a few days and despite my love of ice cream, that got a little old. Hang in there! Like you said, at least you can still drink wine! Definitely give Cashew Milk a try Ilona – It’s very rich, and creamy. I love the vanilla flavor! wow these are truly the best popsicles EVER, so creamy and the caramel flavor OMG, Pinning! I agree Sarah – Salted caramel is definitely a weakness of mine! Try it on Pumpkin Pie for Thanksgiving! You had me at salted caramel. These look totally amazing! I can’t imagine not being able to eat solids for that long, but have heard stories from my husband who had his jaw wired shut after surgery and had to eat out of a straw. You’ll make it through! Thanks Bryon! I agree with you – It’s not all bad. As long as I can still enjoy sweet treats and wine! Thanks Michelle! I agree – I love these on hot summer days (and nights)! My husband would love these!! He’s dairy-free and always feels like he’s missing out on summer ice cream treats. Thanks for creating this recipe!! Of course Chrissie! I hope that he enjoys this!!! The salted caramel does have butter and cream in it, so there’s a little bit of dairy with that. 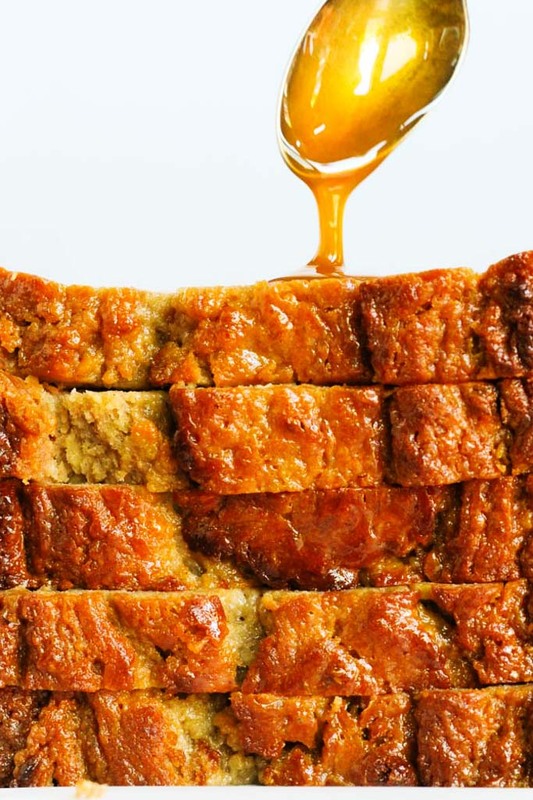 You could always substitute roasted fruit for the caramel as well! Yumm! These look so delicious and easy to make! Definitely gonna give these a try! Absolutely gorgeous popsicles! And that salted caramel…heavenly! Thank you Whitney! Isn’t salted caramel the best? I could eat it on SO many things!!! Hi, I was wondering whether you could use normal milk instead of cashew milk? Hi Isabelle – Definitely feel free to substitute any milk that you would prefer. Oh no Erin, no solid food?! That would be so hard! What about lentils? Or hummus? You can do a lot with those…those are staples here, so that’s what I’m coming up with. Hello Pinterest! I definitely feel for you! Your popsicles do sound wonderful though! I still haven’t tried making any this summer, but these could be the ones that get me there…I love salted caramel! Great ideas for the non-solid food diet Michelle!!! Perhaps I could have just lived on salted caramel alone – I love it too! looks amazing! going to try! I hope you enjoy Rivka!